At Whizz Education, we know how important it is for children to learn their times tables, not just for school but for life in general. Earlier this year, we wrote a blog discussing eight fun ways to teach your child times tables and this went down so well with parents that we decided to follow it up with four more techniques that will teach your child how to memorise multiplication tables. Let’s get started. When discussing how to memorise your times tables, skip counting is a technique that comes up regularly and if your child has already mastered addition, they should pick this up pretty easily. All they have to do is pick a times table, start with the base number (e.g. 4×1) and then keep going up by that number. For example, if they’re revising their four times tables, they start with four, then skip to eight, then 12, then 16 etc. When your child is starting out, we recommend that you skip count along with them until you’re confident that they’re starting to master the technique. Another tip is to get them to use their fingers as they count upwards, so if they’re doing four times tables, when they start with four, they hold up one finger, when they skip to eight, they hold up two fingers etc. Skip counting is definitely an effective technique for helping to teach children how to memorise times tables, however, you shouldn’t just limit your efforts to teaching children how to skip count forwards. To consolidate your child’s learning, we also recommend teaching them to skip count backwards. So, for example, when learning their six times tables, children could start at 60 (6×10) and then work their way back to 54, 48, 42 and so on. Once again, we also believe that when starting out, you should count along with them, particularly when they’re dealing with bigger numbers. This is another fun activity that would be especially good for kids who like arts and crafts. All your child needs to do is get some card and cut out some triangle-shaped sheets. Then in each corner, they write a number, the two numbers that they are multiplying by and the product of those two numbers. So for example, when attempting to learn seven times three, one corner would have a seven, the second would have a three and the third would have 21. Simple! This may seem really obvious, but you’d be surprised how many young children don’t realise that the product of two numbers is the same, irrespective of the order they’re written in (e.g. 3×4 and 4×3 both equal 12). Once children know this, memorising times tables will become a lot easier. Do you still think your child needs a little bit of extra attention in maths? There you have it, four more tips that will help your child memorise and master their times tables. 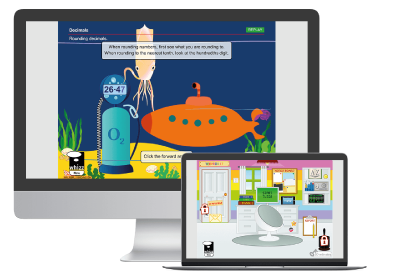 That said, if you think your child still needs a little bit more help, we recommend checking out Maths-Whizz, our multi-award-winning online maths tutor. With individualised lessons and educational maths games for kids that close gaps in their core maths knowledge, Maths-Whizz can help increase your child’s maths ability by 18 months during their first year of use. * So, what are you waiting for? Try our free trial today! Do you have any methods you use to help your child memorise times tables easily? If so, we’d love to hear them. Post them on our Facebook page or send us a tweet at @MathsWhizzTutor.